CheckStar allows all members the opportunity to keep check returns as low as possible. To do this, we offer verification to all merchant members. Verification is the process of checking a customer's identification number against a database in order to see if he/she is a current "check risk". The largest portion of the database offered by CheckStar comes from the central United States. With the addition of new clients, the database continues to be even stronger. CheckStar offers a variety of equipment for verification. One type offered not only verifies check risk, but also does an age calculation for alcohol and tobacco products. By using this machine, your employee saves time on figuring age on customers purchasing age required items, as well as gets the physical drivers license from the customer without hassle, for accurate verification. With equipment offered by CheckStar, you are able to enter the identification number only. With equipment offered by other companies, you may have to enter check number, check amount, or account number. This process takes up valuable time at the point of sale. Along with our verification service we offer "Velocity Reporting". Velocity Reporting is the process by which the system keeps track of the number of times a check writer has been verified for a group of stores. By doing this, you are able to stop those customer's going from store to store writing bad checks intentionally. CheckStar stays current on the latest technology in verification including: Electronic Representment, ACH (automatic clearing house) Transactions, Check Conversion and Internet Verification. Internet Verification can speed up the verification process for you at the point-of-sale. Call us for a demonstration. 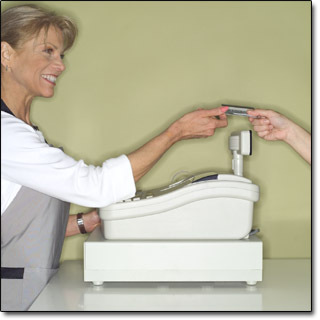 CheckStar can program most credit card terminals.